Banco ABC Brasil SA is a commercial bank authorized by the Central Bank for asset, liability and accessory transactions related to the respective authorized portfolios (commercial, investment, credit, financing and investment and real-estate loans), including FX. Banco ABC Brasil started business in 1989 through a joint venture of the Arab Banking Corporation and the Roberto Marinho Group; this gave rise to Banco ABC Roma SA, which acted in corporate credit and treasury. Since then, the bank has built a solid customer base in the Corporate segment by offering high-value added financial products tailored to clients’ specific needs. The current managament took over in 1991 and includes Brazilian executives with extensive financial industry experience. 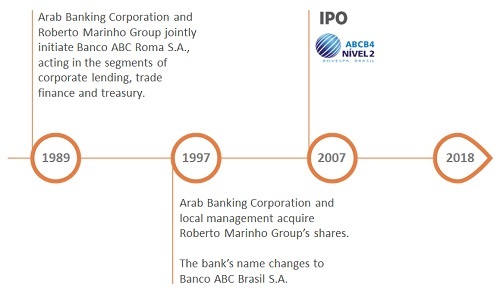 In 1997, the Arab Banking Corporation acquired the Roberto Marinho Group’s stake to become the controlling shareholder and the executives acquired a minority interest aligning their interests with those of the controlling shareholder. In the same year, the bank changed its name to Banco ABC Brasil SA, which remans unchanged to date. In 2007, Banco ABC Brasil held its IPO and was listed on the Level 2 Corporate Governance segment of BM F& Bovespa. The bank’s headquarter is located at Av. Cidade Jardim, 803 – 2nd Floor – Itaim Bibi – São Paulo, SP, Brazil – 01453-000.